See Juniper and use the ground leaf of bearberry as a safer substitute for it. CAUTION! NOT to be taken by pregnant women or those breastfeeding. NOT to be taken by children, or those with kidney disease. High doses cause nausea and can actually inflame the lining of the bladder and urinary tract. Overuse can cause symptoms of poisoning. CONTAINS: Hydroquinones like the crystallized glucoside arbutin (5-12%; strong antibacterial sugar complex metabolized only in the urinary tract where it breaks down into gucose and hydrokinone which is similar in action to the antispetic phenol); shown effective against Klebsiella and Escherichia coli, both associated with urinary tract infections. Hydroquinine in large doses is toxic and can cause ringing in the ears, vomiting, convulsions, and collapse; since doses are usually small, this is generally not a problem. Also contains methyl-arbutin, ericolin, ursone, gallic acid, ellagic acid, ursolic acid, isoquercitrin, flavonoids, resin, calcium oxalate, and tannin. The incinerated leaves yield 3% ash. 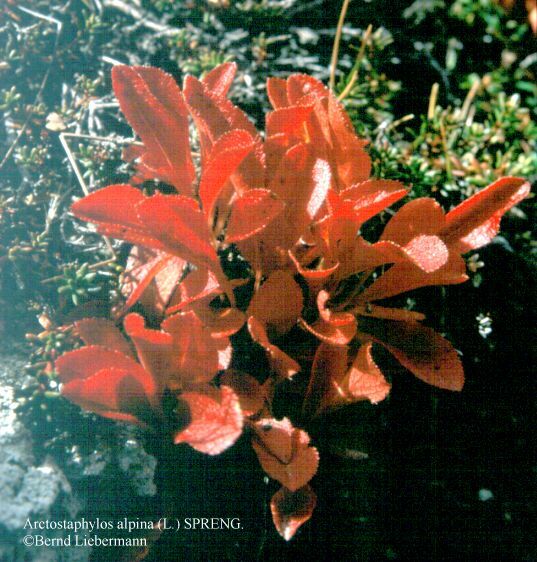 A sprawling shrub with much-branched irregular stems and evergreen leaves with a single, long, fibrous main root which sends out several prostrate stems from which grow erect, branching stems 4 to 6 inches high; found over most of the northern hemisphere (mountains of Europe, Asia, and America; common in Scotland on heaths and barren places in hilly terrain (especially the Highlands), and extends as far south as Yorkshire; also found on hills of northwestern Ireland; in North America it is found throughout Canada and the United States as far south as New Jersey and Wisconsin). Evergreen leaves are leathery (occasionally turning slightly orange or mahogany with age), 1/2 to 1-inch long, spatulate, being rounded at the apex and tapering gradually toward the base to a short stalk; margin is slightly rolled back and the young leaves are fringed with short hairs; upper surface is a dark, shining green with veins deeply impressed; lower side is paler green with prominent veins which form a coarse cross-hatch network, and is without spots; no distinctive odor, but very astringent, bitterish taste. Stems and branches are a dark brown to reddish color. Waxy flowers appear in small, closely crowded drooping clusters, 3 to 15 flowers together at the ends of the branches of the preceding year; flowers bloom in early summer; the corolla, about 2/3-inch across, is urn shaped, reddish white or white with red lip, transparent at base and contracted at the mouth; the mouth is divided into 4 to 5 short reflexed blunt teeth which are hairy within; there are 10 stamens with chocolate-brown anthers. The berry ripens in autumn and is about the size of a small currant; bright red, smooth and glossy with a tough skin enclosing a mealy pulp containing 5 one-seeded stones. The botanical name is taken from the Greek 'arcto' meaning berry and the Latin 'uva ursi' meaning bear. In Green's Universal Herbal (1832) it is listed as Arbutus uva-ursi, but is distinguished from the Arbutus species by having a smooth berry with five 1-seeded stones (Arbutus has rough fruit with each cell of the ovary being 4 to 5 seeded). In the Doctrine of Signatures it was assigned to conditions of 'sand' or 'gravel' related to the kidneys because of its affinity for sandy soils. Was used in the 13th century by the Welsh Physicians of Myddfai' and mentioned by Clusius in 1601. Gerhard of Berlin mentioned it for medicinal use in 1763. It first appeared in the London Pharmacopoeia in 1788. Marco Polo is said to have discovered its uses while in China. Supposedly, Kublai Khan heard of it during his invasions. Certainly, by the 13th century, herbalists were well versed in its uses. In 1803 it was the subject of an inaugural dissertation by Dr. John Mitchell at the University of Pennsylvania. Listed in the USP 1820-1936; in the NF 1936-1950. In the past, supplies of bearberry have been adulterated with the leaves of Cowberry and Box. Astrologically, ruling planets are Mars and Pluto. PROPAGATION: By fresh seed sown into mixture of peat and sand in autumn; by layering of long branches in early spring (place one of the runners in a clay pot while still attached to the mother plant; once rooted, clip off the runner); by semi-ripe cuttings with heel in summer; also by green stem cuttings. NEEDS: Hardy to zone 2. An ornamental which makes a good ground cover and requires a sandy, acid soil (pH 5) in sun or part shade. Benefits from decayed leaf mold or peat moss worked into the surface of the soil. Pinch back young plants occasionally to encourage compact growth. Useful to check erosion on steep banks. Does well planted between other Heath family plants. HARVEST: Leaves as available during spring and summer, also late summer (sources vary on the perfect time); dried for use. PART USED: Only the green leaves collected in September-October are used medicinally, then dried; should be stored immediately so they do not re-absorb moisture from the air. Berries are taken before the first frost. Manzanita (A. glauca) and (A. columbiana): A California native whose leaves are used in the same manner as bearberry. Leaves are pale green, the bark dark red. Common on dry hills and plains in California. Berries are powdered and mixed with water for a refreshing drink; also the juice was used to make beverage drinks and cider. The berries were gathered by Native Americans and dried for winter use, or eaten raw, or cooked then dried, then ground and made into bread or mush. The leaves are sometimes substituted for Bearberry leaves. Woolly Manzanita (A. tomentosa): Used the same as A. polifolia. Fruit was used by Native Americans in California and the northwestern states>. A. nevadensis and A. patula: The fruit was used by Native Americans in Oregon. A. parryana: The fruit was used by Native Americans in California. A. polifolia: A Mexican plant used medicinally. Trailing Arbutus (Epigaea repens): Another member of the Heath family which also contains arbutin and has been used in place of bearberry. Can be found growing on moist, sandy soils in the shade of low pines, hemlocks and scrub oaks. In Chinese, European, and Native American medicinal systems it is considered to be a kidney herb. In Chinese medicine it is associated with the element of water and is used to treat incontinence (believed to contract the sphincter muscle). Bearberry is said to be more effective if urine is alkaline, so avoid acid foods such as fruits, juices, sauerkraut, vitamin C, etc. when taken as part of a regimen. Arbutin exerts an antiseptic effect on the urinary mucous membrane and is absorbed with little change and excreted by the kidneys. Has been taken in tea, capsule and extract form as well as a douche. Usually taken as a cold infusion which is warmed up (if desired). One ounce of bearberry has often been combined with 1/2 oz each of poplar bark and marshmallow root in 1 pint of water, then steeped 20 minutes. Another formula for urinary infection combines couch grass, yarrow, and echinacea. Astringent, antibacterial; tonic; urinary antiseptic; produces a powerful antiseptic in kidney tubules; has been used to treat acid urine (will sometimes change color of urine); reduce uric acid in blood; a possible mild diuretic action which has been used in cases of female disorders and diabetes. Has been primarily used for bladder and kidney infection and irritation and as part of a formula to dissolve kidney stones (combination of bearberry, parsley piert, and pellitory of the wall); also used as a major component of compound formulas to treat prostate inflammation. Has often been combined with buchu for water retention and urinary tract infection. Has been used internally for urinary infections, diseases of the bladder and kidneys (used to tone urinary passages as well as for inflammatory diseases of the of the urinary tract); also as a douche as well as internally for vaginitis, leukorrhea, uterine ulcers, excess menstruation, vaginal infection (the Menominees dried the leaves and used them as a seasoner in female remedies); has been used as a pelvic tonic for cystic catarrh and prolapsed uterus (by combining 1 oz each of bearberry, squaw vine [Mitchella repens], and 1½ oz dandelion root; simmer in 1 quart water for 20 minutes, strain, and 3 to 4 tbsp taken three times daily); has been used in treating recurrent cystitis in paraplegics; also for urethritis, nephritis (said to relieve pain), kidney and bladder stones, pyelitis; has also been used in coma to control kidney and bladder infections; infusion have also been used for bronchitis; less well known for treating rheumatism, acute Bright's Disease, and gallstones. For gravel, suppressed urine and inflammation of the bladder 1/2 oz bearberry, 1/2 oz. white poplar bark, 1/2 oz marshmallow root have been combined and infused in 1 pint of water just off the boil for 20 minutes; strained and taken 3 tbsp, three times daily. Taken warm as a diaphoretic to treat enlargement of the prostate and irritation of the urethra. During a bladder infection, the leaves were chewed. In Europe tincture of uva ursi was prescribed postpartum to reduce bleeding and help shrink the uterus. Has been used as part of a compound formula for venereal disease. Has also been used as a broad-range remedy for diabetes, liver and spleen problems (to cleanse and strengthen), hemorrhoids, and mucous discharges. Has been used in combination with blueberry for diabetes (20-40 drops tincture of blueberry leaves, 10-20 drops tincture of bearberry; dose is 10-20 drops in water three times daily). Has been used externally and internally for hemorrhoids and piles; also as a warm infusion for chronic diarrhea and dysentary. Has been used to strengthen contractions during labor. Hs been used in bedwetting remedies (not for children under 12) by combining 1 oz bearberry, 1/2 oz each of white poplar, sumach berries, and yarrow; simmer in 1 quart of water for 20 minutes; strained and taken 3 tbsp three times daily. Has often been combined with marshmallow, couch grass, corn silk and buchu. Used with horsetail, couch grass, and cornsilk to soothe inflamed mucous membranes. Hs been used externally to soothe sprains and swellings; Native Americans rubbed the wet leaves on sore muscles and also made a poultice from the crushed plant after boiling. The Cheyenne used it both internally and externally for sprained back; all of the above ground parts being boiled and the infusion drunk; the wet leaves were rubbed over the affected part. Has also been used for relief of poison ivy (no doubt due to its high tannic acid content). Berries were used to combat scurvy. INFUSION = To reduce tannic acid, prepare 1 oz of leaves to 1 pint of cold water; steep 12 to 24 hours. Taken 1/2 cup as needed up to 3 cups daily. Can also be prepared by infusing 1 to 2 tsps leaves in water just off the boil and steeped for 5 to 7 minutes and taken 3 times daily. TINCTURE = Up to 4 ml 3 times daily (1 to 2 ml average dose or 10 to 20 drops) in water. COMPOUND TINCTURE = 2 to 15 drops tincture of quaking aspen, 10 to 20 drops tincture of bearberry; combine, take 10 to 20 drops. CAPSULES = 1 up to 3 times daily. OTHER = Soak dried powdered leaves in brandy, then take a small amount mixed in water; OR, leaves can be soaked in brandy or other alcohol with 1 tsp of the soaked leaves added to 1 cup of boiling water and taken 2 to 3 cups per day, cold. Leaves can also be soaked in brandy for 1 week before making an infusion; add 1 tsp of brandy to 1 cup of the infusion. ARTHRITIS TEA = Combine equal parts bearberry leaves, black cohosh, chamomile, cascara sagrada, pokeweed root and sassafras; steep 1½ tsp of the mixture in 1 cup of boiling water for 10 minutes; take 1 cup morning and evening. KIDNEY PROBLEMS = Combine 8 parts bearberry, 6 parts couch grass, 5 parts buchu, 3 parts button snakeroot, 3 parts pipsissewa, 3 parts jumiper berries, 1 part celery seed, 1 part lovage root; boil 1½ tsp of the mix in 2 cups of water for 2 to 3 minutes; let stand 10 minutes and strain; take 1 cup morning and evening. CYSTITIS = Combine 1 part lovage root, 1 part parsley seed, 2 parts bearberry leaves; bring 1½ tsp of the mix in 1 cup of water quickly to a boil; take 1/2 cup 2 times daily. BLADDER INFECTION= 10 grams (about 1/2 oz) daily; antibacterial activity occurs 3 to 4 hours after taking. Used for cyanosis, cystitis, dyspnoea, dysuria, haematuria, nausea, pyelitis, rash without itching, urinary affections, uterine hemorrhage, vomiting, weak and irregular pulse..
Dose= of the tincture, 5 to 30 drops; for pyelitis, a trituration of the leaves. Used in farm animals for conditions similar to those in humans. See Cooking with Herbs and Wild Foods The fruit (kinnikinnick) is used the same as Manzanita; also used for seasoning meats. Leaves produce a camel-beige color with no mordant. The whole plant produces green with an alum and iron mordant. Aerial portion of plant produces a yellow-green to gray without mordant; green with alum and copperas; blue-green with blue vitriol. In Scandinavia an ash colored dye was obtained from the plant. Due to the high tannin content in the leaves, it has been used to tan leather in Sweden and Russia. Native Americans added the leaves to 'kinnikinnick' (a smoking mixture) in their peace pipes; this was smoked during tribal councils; was believed to be calming and mentally clarifying. The word 'kinnikinnick' is Algonkian, Cree, or Ojibwa, meaning 'that which is mixed'. 'Sagacomin' is an Algonkian word meaning 'smoking leaf berry'. The berries are eaten by grouse, but avoided by cattle. Used as a 'visionary' herb by those seeking increased psychic ability. CAUTION! Excessive dosing and long term use can cause chronic liver problems, especially in children. Very similar to Bearberry (above), but leaves are not evergreen; they wither but remain on the plant. Native to northern Europe, northern Asia, and North America. Hardy to zone 2. Berries are black, juicy, 6 to 10mm with separate nutlets. Seeds have been found at the Juntunen site in Michigan by archeologists dating to 1070-1320 A.D.; seeds have also been found at the Isle Royale site. Stems, leaves, and berries were decocted and taken by many native tribes for back pain. Some Native American tribes inhaled the smoke for headache. Berries were prepared for eating by roasting in a fry pan, then mixed with salmon oil or animal grease. The Chippewa cooked the berries with meat as a seasoning. Badge of the Clan Ross. The leaf was dried and pounded, then mixed and smoked. Early French settlers used it the same as the Indians to smoke. Smoking the leaves was said to be relaxing. Was also smoked in a pipe to attract game. Some Native Americans used it in medicine ceremonies. Leaves and stems used in Russia and Sweden for tanning.